We are talking here about contemporary jewelery but also about antique jewelery, jewels that carry the story of the woman or the man who will have worn them. Tales of transmission and passion, creation and technique. Our reports tell all the art of jewelry, from the birth of a jewel from fine or precious stone - diamonds, rubies, emeralds, sapphires - to the final jewel. The latest collections of fine jewelry, including ideas like precious flowers from an enchanted garden. Photographs: Buonomo & Cometti. Flowers: Hervé Chatelain. Models: Mavaro @Elite and Samuele. Necklace from Chanel's "Coromandel" haute joaillerie collection. Photos: © Buonomo & Cometti. 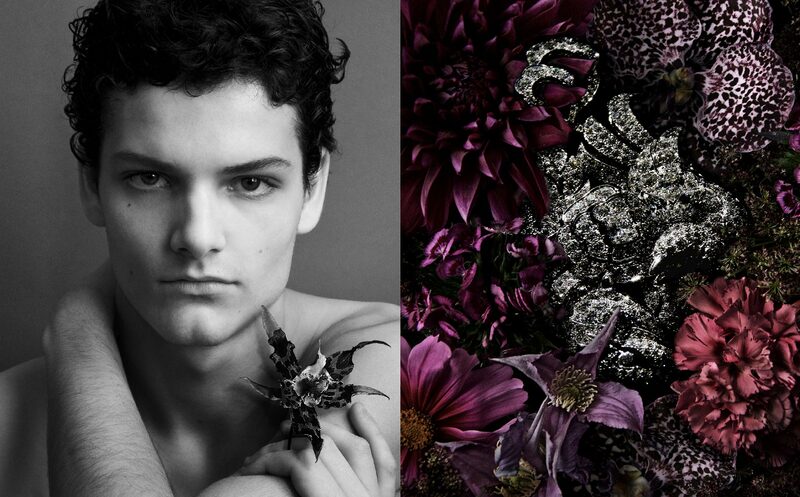 Emmanuel Tarpin, the rising star of haute joaillerie, creates unique pieces that tell stories. Discovered in the Gulf of Panama by a slave in 1579 this pearl could be a subject of romance. Piaget called on Nelly Saunier to make two feather marquetry wristbands. Towe Norlen wants to translate the mysteries of science with his organic shapes. A day at the Ecole des Arts Joailliers Van Cleef & Arpels to learn gouache techniques. A unique tradition in the gemstone industry: two words that are worth more than a signed contract. Interview with Ronny Totah, president of Horovitz and Totah, and co-founder of GemGeneve. The first edition of GemGenève will take place from 10 to 13 in Geneva May: the show is already a success. Chanel's latest fine jewelry collection is inspired by a lion sculpture in Gabrielle Chanel's apartment. Victoire de Castellane reveals some secrets about Dior's latest fine jewellery collection. Portrait of a philanthropist, a great collector of pre-revolutionary Russian art and jewellery. Christmas solo in the suite 211-212 Beau Rivage, one of the most beautiful palaces of Geneva. The latest collections of fine jewellery in some paintings lit by the star of the night. The 163,40 carats diamond was sold 29,5 CHF million on November 14 by Christie's in Geneva. Artistic direction and shots: Aimee Hoving and Marc Amiguet; Styling: Isabelle Cerboneschi. He is known as his most famous owner: the strange destiny of Barbara Hutton's jade necklace. baptized The secret, This sequel to 110 Jewelry is an ode to metamorphosis and hidden messages. Fine jewellery in chiaroscuro. Realisation, photographs and stylism: Buonomo & Cometti.